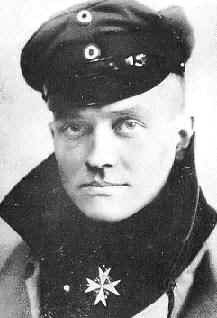 Manfred von Richthofen was born on May 2, 1892 in Breslau, Germany (now Wroclaw Poland). He died on April 21, 1918 in the skies over Vaux sur Somme, France. He was 25 years old. He was called der rote Kampfflieger (The Red Battle-Flyer) by his own people, le petit rouge by the French, and the Red Baron by the English. In a time of wooden and fabric aircraft, when twenty air victories insured a pilot legendary status and the coveted Pour Le Mérite, Richthofen had eighty victories, and is regarded to this day as the ace of aces. Manfred von Richthofen was born the son of Major Albrecht von Richthofen, a Prussian nobleman and his wife, Kunigunde. (The name Richthofen means "court of judgement" and was bestowed by the Holy Roman Emperor Leopold I.) Manfred was the eldest of three sons (the eldest child was his sister, Ilse). He was enrolled at age 11 at the military school at Wahlstatt, and then attended the Royal Military Academy at Lichterfelde. Manfred was a far better athlete than he was a scholar, and applied his horseback riding skills to become a cavalry officer. He was commissined in April, 1911 in the 1st Regiment of Uhlans Kaiser Alexander III. He was promoted to Leutnant in 1912. September - In his second air combat (still as an observer), Richthofen exchanges fire with a French plane. The Allied plane dropped away and crashed, but Richthofen was not credited with the victory as the enemy plane crashed behind French lines (and could therefore not be confirmed). Later in his career, Richthofen would not be held to this restriction: he was taken at his word for his kills. Apr 24 - Richthofen shoots down his first plane as a pilot. 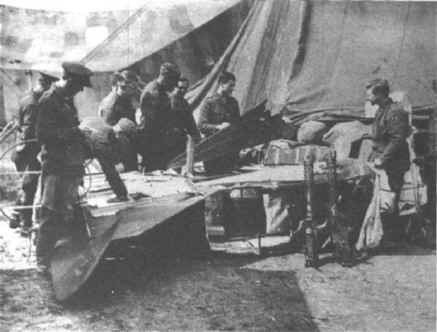 The craft, a French Nieuport, crashed behind enemy lines, and again the victory was not officially credited to Richthofen. Sep 1 - At Oswald Boelcke's invitation, Richthofen reports for duty on the Western Front. He begins his career with Jagdstaffel 2 in an Albatros D.II biplane. Although it was the Fokker Dr.I triplane with which Richthofen is remembered, he spend the vast majority of his time flying biplanes like the Albatros D.II and D.III. Sep 17 - Richthofen scores his first confirmed air victory. October: After 40 victories, Oswald Boelcke is killed in a mid-air collision during combat. Some accounts blame Richthofen's enthusiasm for the collision which caused pilot Erwin Böhme's undercarriage to collide with Boelcke's upper wing. Others place the blame on Böhme, or simply an accident not attributable to anyone. Nov 23 -- Richthofen, with the help of a superior aircraft, makes British ace Major Lanoe Hawker his eleventh victim. Jan 4 -- Richthofen scores his 16th air victory, making him the top living German ace. On January 12th, Richthofen receives the Orden Pour le Mérite (the "Blue Max"). He is given command of Jasta 11. Richthofen decides to paint parts of his aircraft red, in part to identify himself easily to his allies on the ground (whom he feared would otherwise shoot at him). It has been suggested that he chose red because it was the color of his old Uhlan cavalry regiment. This begins a series of traditions: each plane in his squadron begins to display some red coloring to show solidarity. Later in the war, some British planes bore red noses, announcing their intentions of hunting down the red baron. Jan 24 -- The lower wing of Richthofen's Albatros D.III breaks off in flight (a common problem for that type). Mar 9 -- Richthofen is shot down over Oppy, but was flying again the same day. Apr 8 -- The lower wing of the Albatros D.III flown by another member of Jasta III breaks off in flight. Richthofen writes an angry letter to Berlin, and is visited by aircraft designer Anthony Fokker, who literally goes to the trenches to observe aircraft. The result of this visit (in which he was able to observe the British Sopwith Triplane) led to Fokker's development of the Dr.I triplane. Apr 29 -- Richthofen shoots down four planes in one day, a personal best. April, 1917 is known as "Bloody April". Britain lost 912 pilots and observers during the month, while Richthofen scored an incredible 21 victories during the same period. After his 41st victory, Richthofen was ordered on leave. Turning command over to his brother Lothar, Manfred left the front on May 1st and did not return until early June. He spent his vacation hunting in his home town, on propoganda tours, and meeting with Kaiser Wilhelm. Jun 24 -- Jagdgeschwader 1 (Fighter Wing 1) is formed, with Manfred von Richthofen in command. The wing would later be renamed "Jagdgeschwader Frieherr von Richthofen" in his honor. July: Richthofen is shot down by Capt. Douglas Cunnel and 2nd Lt. Albert Woodbridge. Though he lands safely, he has suffered a serious bullet wound to the head. Manfred would suffer from terrible headaches until the end of his life, but there were other ramifications. German command, recognizing the propaganda value to the enemy of Richthofen's loss, begins to pressure him to retire from air combat, going so far as to forbid him from flying unless absolutely necessary (a loophole Richthofen exploited at every opportunity). Richthofen began to spend more and more of his time in more administrative and public relations roles. Eventually he returned to the front full-time when Germany's leaders realized that no matter the risks, they could not afford not to let Richthofen do what he did better than anyone else. August: The first Fokker triplanes are delivered to Jagdgeschwader 1. September 1 -- Richthofen scores his 60th victory, his first in the Dr.I triplane. On September 6th, he took a leave of convalescence, and when he returned in the next month he went back to flying the Albatros D.V. April: Richthofen achieves two victories flying Fokker Dr.1 triplane (number 425/17). Though he flew biplanes for nearly all of his career, and most of these were only partly painted red, it is the Dr.1 triplane, blood-red from cowl to tail, which is commonly associated with the Red Baron. On April 21, Richthofen followed the Sopwith Camel of Wilfred May far into British territory. The end of the war was only months off by this time, and the Germain air command faced both ever-improving British airplanes and their own dwindling numbers. The thrill of the hunt was all but gone for Baron von Richthofen, as most of his peers had already been killed and his own wounds agonized him. Though the German air doctrine he himself wrote stated that "one should never obstinately stay with an opponent which, through bad shooting or skillful turning, he has been unable to shoot down while the battle lasts until it is far on the other side", he chased his British quarry far deeper into enemy territory and far lower to the ground than his own doctrine permitted. May later said that it was only his erratic, untrained piloting which saved him. He followed the erratic path of the novice pilot until a single bullet, shot from behind him, passed diagonally through his chest. The shot is commonly believed to have come from Australian gunners on the ground, but might have also come from the guns of Canadian flier Arthur "Roy" Brown who was coming to May's aid. Manfred von Richthofen crashed into a field alongside the road from Corbie to Bray. His body was recovered by British forces, and he was buried with full military honors.